None of the scores of pages of U.S. indictments handed down Monday against Huawei Technologies Co. explicitly mentioned anything about 5G networks or China’s spy agency. Canada sending 'dangerous' signals to China and U.S.
Peter MacKay, partner at Baker McKenzie and former foreign affairs minister, says Canada is sending dangerous contradictory signals to China and the U.S. over the detainment of Huawei's CFO. The indictments are a direct attack on Huawei’s credibility. In one, the U.S. alleges that Ren and Meng misrepresented Huawei’s business with Iran to the American government and four financial institutions since 2007, in violation of American sanctions. The indictment also accused the company of destroying evidence once it became aware of the U.S. investigation. The other set of charges cite emails between Huawei USA and China to show how engineers conspired to steal trade secrets from T-Mobile USA Inc. The documents cite emails from employees in China who repeatedly pressed their colleagues to collect key information on “Tappy,” a robot used to test mobile phones that Huawei wanted for its own use. When T-Mobile complained about the attempted theft, Huawei allegedly covered up the matter with a faulty internal investigation and blamed rogue employees for any wrongdoing. In fact, Huawei had set up an internal committee that handed out monthly bonuses to employees who stole the most valuable IP from competitors, the suit alleges. Twice a year, special bonuses were paid to employees from three regions who had collected especially important confidential information. 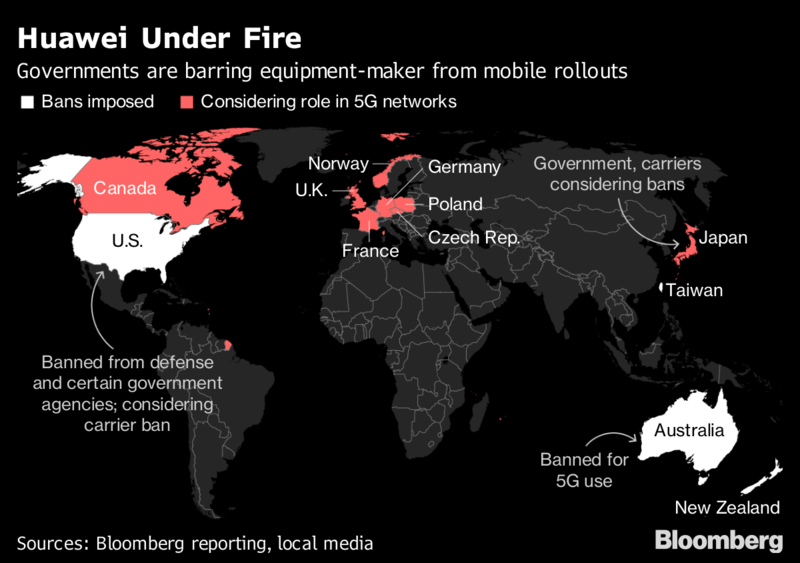 Even more than current technology, control over 5G networks could allow an enemy to wreak mass industrial sabotage and social collapse, according to U.S. officials. This week the European Union’s digital chief Andrus Ansip urged companies to reconsider partnerships with Chinese companies due to an intelligence law that mandates any organization and citizen to assist Beijing’s spy agencies with investigations. Brett Wilson, chairman of Canoe Financial, discusses the tensions between Canada and China over the arrest of Huawei's CFO after U.S. prosecutors filed criminal charges against the Chinese company. The battle over Huawei and 5G is only part of the fight. The U.S. is also looking to curb China’s “Made in China 2025” plan to dominate other vital technologies, from robotics to new-energy vehicles to biotechnology, as part of its trade war.